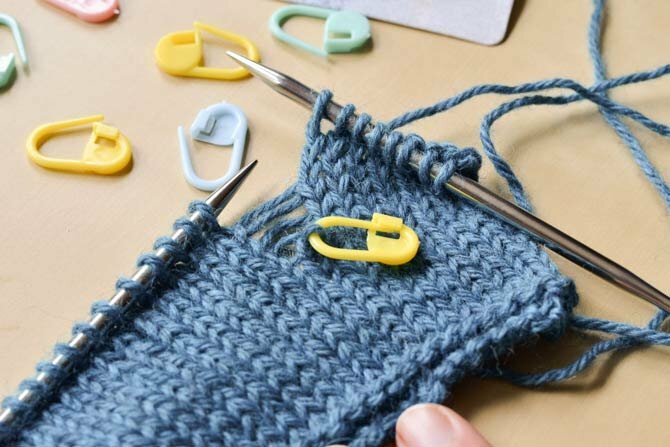 Knitting is a wonderful craft for expanding your skills, because there are always so many new techniques to learn, new knitting tools to use, and so many new patterns out there to try. If you’re like me, you always have more than one project on the needles at once. If my sweater project is too big and heavy to take with me, then a hat or a pair of socks is perfect transit knitting if I’m riding a train or waiting for an appointment. As a result, I often find myself needing to reach for the same kinds of tools over and over again, such as stitch markers. Let me explain why stitch markers are the best knitting tool in your kit! Stitch markers are very versatile tools to keep in your kit. These little tools are incredibly useful, and easy to keep within reach. 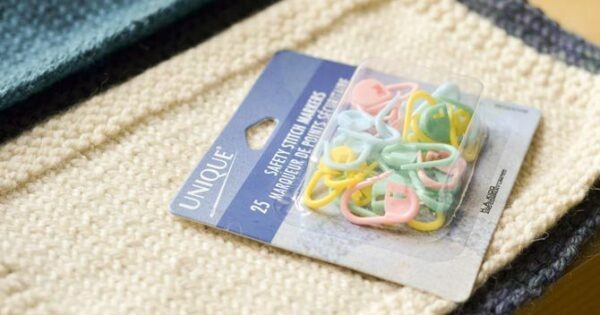 Stitch markers of all kinds – especially closable ones like these – are useful for just about every kind of knitting project and every skill level. That’s more than you can say about most knitting accessories! Here’s a list of my top four reasons to use stitch markers in your knitting. When you’re knitting back and forth on a flat piece it can be easy to forget whether your next row is a Right Side or Wrong Side row, so an easy tip is to clip a stitch marker like these onto the Right Side and it makes a good colorful reminder of where you are in your work. Mark the ‘right side’ of your work to avoid mistakes. When you’re knitting “in the round” with circular needles, make sure you know where your round begins and ends. It sounds too obvious but is so helpful to remember. Slip a stitch marker onto your needle and you’ll know when you get to it again that you’ve finished the round. 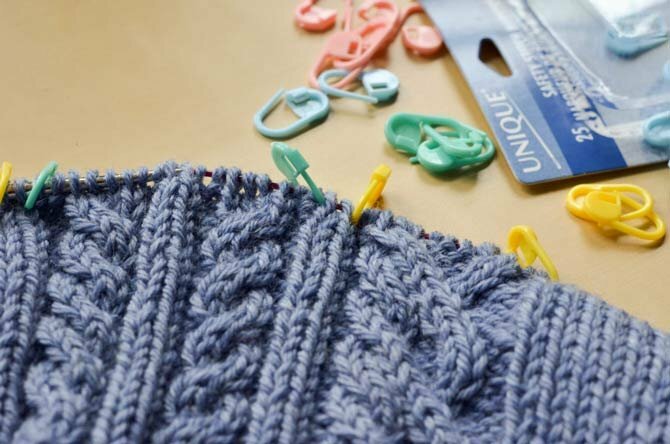 Simply slip the stitch marker from the Left Hand needle to the Right Hand needle and it will be there waiting at the end of the next round. 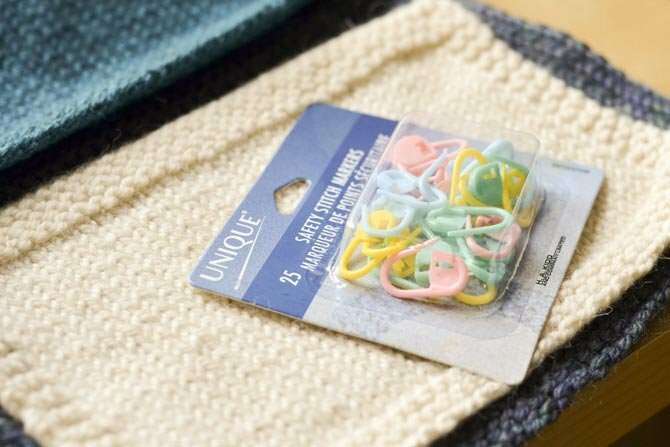 If you’re a knitter who likes working with stitch patterns like cables or lace, or even textured patterns that use combinations of knit and purl stitches, stitch markers can be your best friends. It’s always helpful to have a stitch marker resting on the needles to mark the spot where the pattern begins and ends. This way, you can catch mistakes more easily if you discover you have too many stitches for a pattern repeat, or not enough. Use markers to track where your stitch patterns change. This might be my favorite use for these safety stitch markers! Who among us has not had to deal with dropped stitches at some time in our knitting lives? It’s probably the most common mistake, and also one of the most nerve-wracking if you’re a new knitter. The first step towards fixing these dropped stitches is to make sure they don’t drop down any farther. 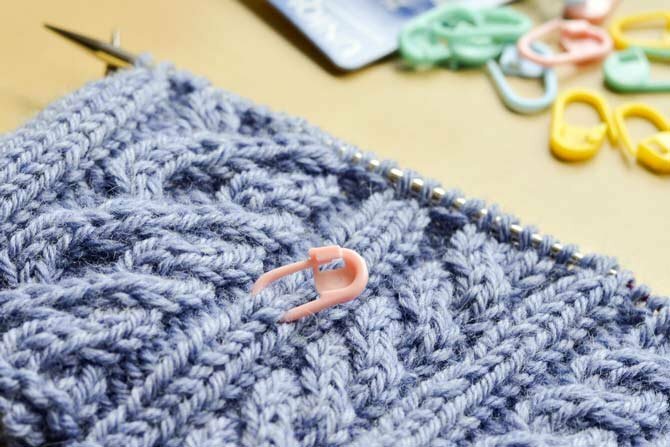 Slip it onto a closable stitch marker where it can rest safely, then find a crochet hook to pick the stitches back up the “ladder” to rest again on the needle. Rescue a dropped stitch before it causes more trouble! I also love that these come in so many different colors, so you can assign different uses to each color if you feel like it or it helps with intricate patterns. What would you do without stitch markers: the best tool in your kit? !